The Folding Craft Station by Studio Designs suits a variety of artists' needs. Easy to manage, this table assembles without tools in five minutes or less and folds flat for easy storage. The table top adjusts to 6 different angles ranging from 0 to 35 degrees. Its frame is built of heavy gage steel for durability. 4 removable side trays are available for supplies. A 24'' pencil ledge slides up and locks into place when needed. 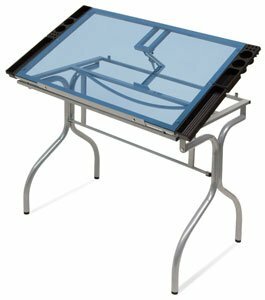 The Silver/Blue Glass table option features a tempered safety glass top and can be used with light pads or light boxes as a Light Table for tracing (Light Pad Support Bars #10049 may be purchased separately). Floor levelers on each leg add stability. Available in Silver/Blue Glass and Black/White. Main work surface: 35.25''W x 23.75 D. Overall dimensions: 40.75''W x 23.75''D x 30.75'' - 44.25 H.